Information on the packaging of food is how the food manufacturer passes information to the consumer. The information can be divided into three types: an ingredients list, nutritional information and information about the manufacturer who produced the food product. Where appropriate, allergen information may also be provided. In the U.S., the ingredients label can be placed either before or after the Nutrition Facts panel and it is of interest to many consumers who are concerned to know what they are eating. However, this information is essential to consumers with food hypersensitivities because it helps them determine whether a food is safe for them to eat. Whilst the ingredient list gives the ingredients of a packaged food, food labelling law does not require that all ingredients need be listed if their presence does not have a function in the finished product. Some ingredients can be collectively labelled such as spices, flavors, and colors. This means that a food ingredient which can cause a reaction in food hypersensitive consumers may be in a food without being declared on the ingredients label. To help ensure this does not happen, the Food Allergen Labelling and Consumer Protection Act (FALCPA) was passed in the U.S. in 2004. This Act requires the presence of the eight major food allergens (which cause approximately 90% of hypersensitivity reactions to foods) in any packaged food to be declared using a name that is recognizable to consumers. The FALCPA requirements only apply to foods and other products (pet foods and dietary supplements) regulated by the U. S. Food and Drug administration (FDA). However, the U.S. Department of Agriculture has adopted the FALCPA requirements for the foods which they regulate (meat products, poultry products and egg products). Also, the Tax and Trade Bureau (TTB) that regulates labelling of alcoholic beverages in the U.S. has adopted the FDA requirements. So in practice all packaged foods sold in the U.S. have to adhere to the FALCPA requirements. What are the FALCPA requirements? FALCPA requires that the presence of any of the eight major food allergens (known as the 'Big Eight') is declared on the ingredients list. In addition to the ingredients list there may also be a 'Contains' statement which must either immediately follow the ingredients list or be next to it on the package. If there is no 'Contains' statement on the package then the common English name for the allergen must be included in the ingredients list. However if a 'Contains' statement is used then the food may be listed in the ingredients list using just its chemical name e.g. sodium caseinate because milk from which it is derived will be listed in the "Contains" statement using its common English name. If a "Contains" statement is used, it has to identify any of the 'Big Eight' which are present in the product. The type of Fish, Crustacean Shellfish or Tree Nut must be declared in either the ingredients list or the "Contains" statement. 'Soy or 'Soya' can be used instead of the term 'soybean(s)'. 4) does not inherently contain gluten; and that any unavoidable presence of gluten in the food is below 20 ppm gluten (i.e. below 20 mg gluten per kg of food)." Whilst many foods labelled as gluten free already meet the specifications of the new rule, this cannot be assumed to be the case until the deadline of August 5th 2014. Further information on Celiac disease and its management can be found in the separate section of this website and also from the website of Beyond Celiac, formerly known as the National Foundation for Celiac Awareness. What about other foods which may cause reactions? Consumers who react to a food which is not one of the 'Big eight' cannot depend on the "Contains" declaration as it will not give information about food ingredients which are not one of the big eight (for example, sesame seeds). To get information on these foods, the consumer needs to look at the ingredients label. However, these foods would be declared on the ingredient label in most circumstances because these ingredients have a technical or functional effect in the food. Despite this the consumer still needs to learn common names for ingredients derived from these foods e.g. tahini for sesame seeds. Another exception is the use of collective terms on ingredient lists such as spices, flavors, or colors which are not required to declare the presence of foods unless components are derived from the Big Eight. Examples of precautionary labels. The term in brackets [ ] may differ depending on the food concerned. "Manufactured in a facility that uses [egg] ingredients"
"Manufactured in a facility which processes [egg]"
"Processed in a facility that uses [milk]"
"Manufactured on equipment that processes products containing [peanuts]"
"Manufactured on equipment that uses [milk]"
"Manufactured in a facility that processes [tree nuts], but not on the same equipment"
"Manufactured on shared equipment...may contain [peanuts, tree nuts, wheat, soy, milk...]"
This is the type of labelling that uses terms such as 'may contain'. This type of labelling (also termed advisory labelling or defensive labelling) is strictly voluntary and not required by federal regulation. Consequently, situations when precautionary labelling may be used vary among food companies, as does the wording of the statements used (see Table for some examples but note this list is not exhaustive!!). FDA specifies that such labelling cannot be used as a substitute for good manufacturing practices such as allergen identification and control, cleaning of shared equipment, and segregation during processing. Some consumers believe manufacturers use precautionary labels as a way to protect themselves from legal action in case a food causes a reaction. This is not typically the case since this type of label should only be used by food manufacturers when there actually is a possibility (however small) that the food may contain an allergen which is not an ingredient but may be present as a result of the manufacturing process. 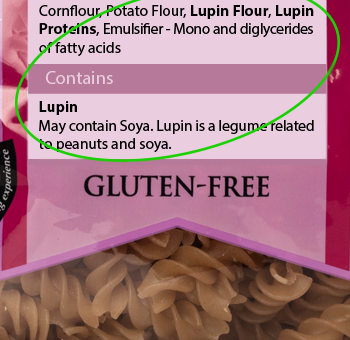 We know this type of labelling is not liked by consumers but currently it is the only way for food manufacturers to inform consumers if there is a possibility that an allergen which is not part of the final product may be present in the food. In the future, some restrictions may be placed on the use of precautionary labels but that is not yet the case. From the above table detailing different examples of precautionary labels, it can be seen how manufacturers choose to word their precautionary statements can vary greatly. Consumers MUST NOT interpret this difference in wording as a difference in the likelihood that the stated allergen is present. All precautionary labels mean the same thing, regardless of the words they use. They all mean that there is a possibility that an allergen which is not part of the final product may be present. Consequently all precautionary labels must be treated with the same level of care, regardless of their wording. The nutrition facts box is where nutrient information about the food product is given. Although this information is not as important from a food safety stance for consumers with food hypersensitivities, it is important as all consumers are encouraged to eat as healthily as possible. The information contained in the nutrition facts box can help consumers make healthy choices. The manufacturer's, packer or distributer's name, address and a contact telephone number must be on the food packaging, next to the ingredients list. This information is given in case the consumer would like to contact the manufacturer about something to do with the food product. Reasons for contacting the manufacturer are generally to enquire about the product ingredients and the processing it may undergo or to inform the company that the food may have caused a reaction after it was eaten ( see section on "When to contact a food company').